I made this lunch for my 17 year old niece during her last days in high school. She enjoys eating salsa-rice and black beans so I incorporated them into this bird themed meal. Contents: Cardinal – cooked Nishiki rice mixed with a little salsa and pack into a cookie cutter by pressing down with plastic wrap, then carefully remove cookie cutter, dried blueberry eye, ground black sesame seeds, orange Cheddar beak, lettuce, asparagus, sugar snap peas, strawberry, black beans with salsa and corn. Nest – pie crust cut into circles and carefully place in muffin cups – bake weighted with aluminum foil and beans or pie weights, when pie crusts are cooled add a drizzle of melted chocolate and fresh blackberries. 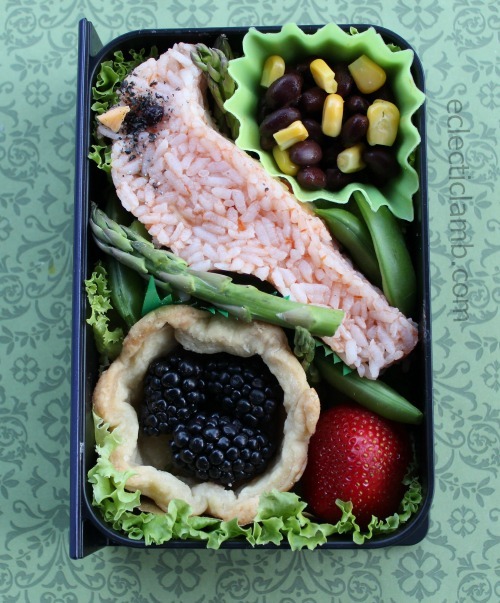 This entry was posted in Bento / Cute Food, Food and tagged bird, book bento box, Cookie Cutter, salsa rice. Bookmark the permalink. This lunch looks fabulous!! I love every part of it! Our niece must have really liked this one and probably didn’t want to eat it because it looked so nice. I wonder if she tasted the dessert first. A good one to enter into competition! Thank you so much for your kind words. Funny that you mentioned competition because I originally designed it for a competition but did not make it and enter in time. So I made it for our niece instead.